“You Are Loved” is a project about spreading love, sharing stories and giving from the heart. This project came about from a very serendipitous experience I had following the death of my grandmother Edna who was such a giving soul and shared her love openly with all those whom she met. She taught me to crochet when I was a young girl and she still crocheted right up until she went into the hospital. I knew after her passing that I wanted to find a way to keep her gracious spirit alive and share our mutual love of crochet. On the plane ride to Chicago for the funeral, I started to crochet some little granny square hearts. I decided to make a garland out of them to put in Nanny’s casket, one from each of her nine great-grandchildren. At her funeral service, the pastor spoke about Nanny’s love of crocheting. The pastor shared that she too learned to crochet from her mother who told her that the only pattern she needed to remember was the granny square…because the granny square starts as a circle and everything is built upon the circle. Just as in life; it all comes around full circle. We are born, we grow, we die and on and on and on. It seemed kismet to me that she should speak about the granny square after I had just made the garland of hearts from the very same pattern. 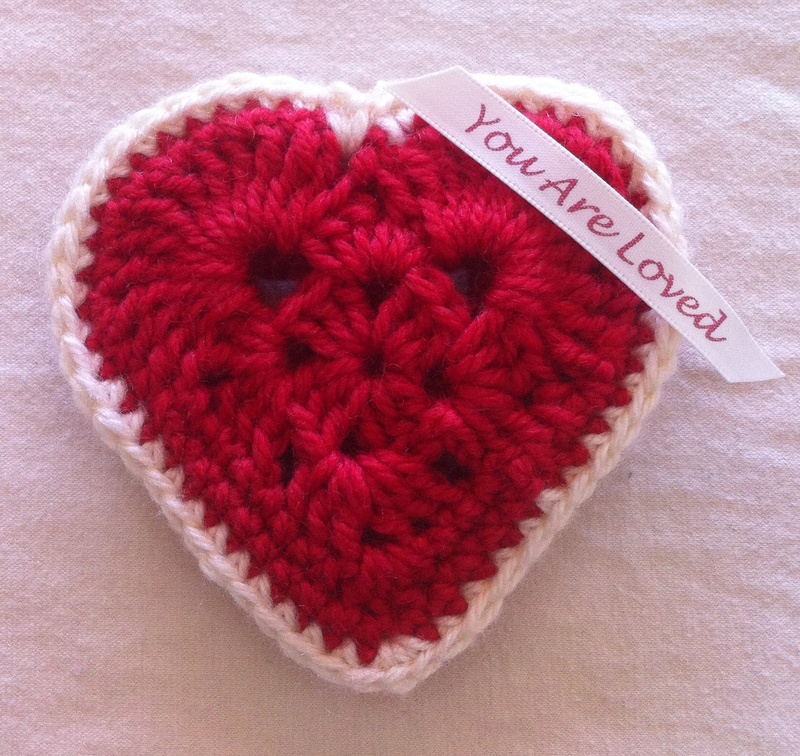 After her funeral, I kept crocheting the hearts because they gave me a sense of comfort and connected me to my grandmother. Then one day I gave a heart to a stranger with a handwritten tag pinned to it that said, “You Are Loved” and from that random act of kindness, this project was born. 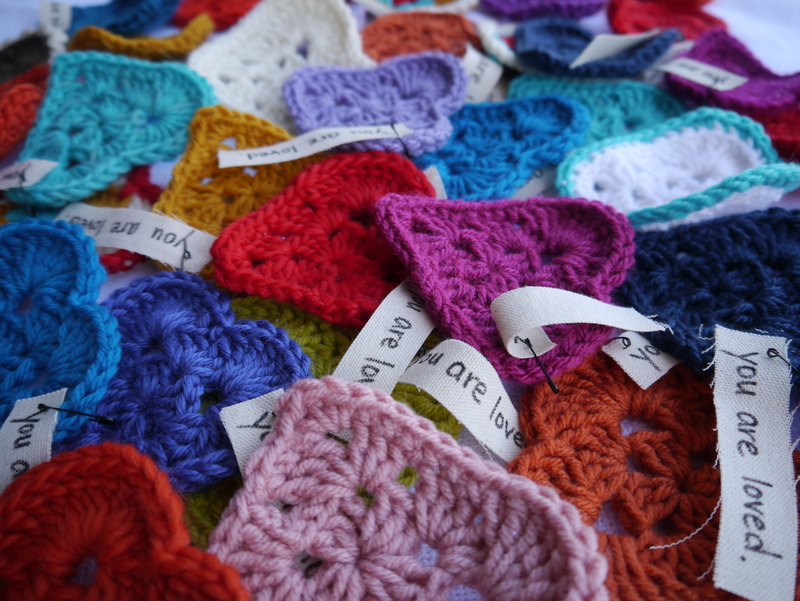 These small, crocheted hearts send a big message: we are all loved by someone in this world. The sole purpose of this project is to spread that love and to remind people of this powerful force that can transform our lives. 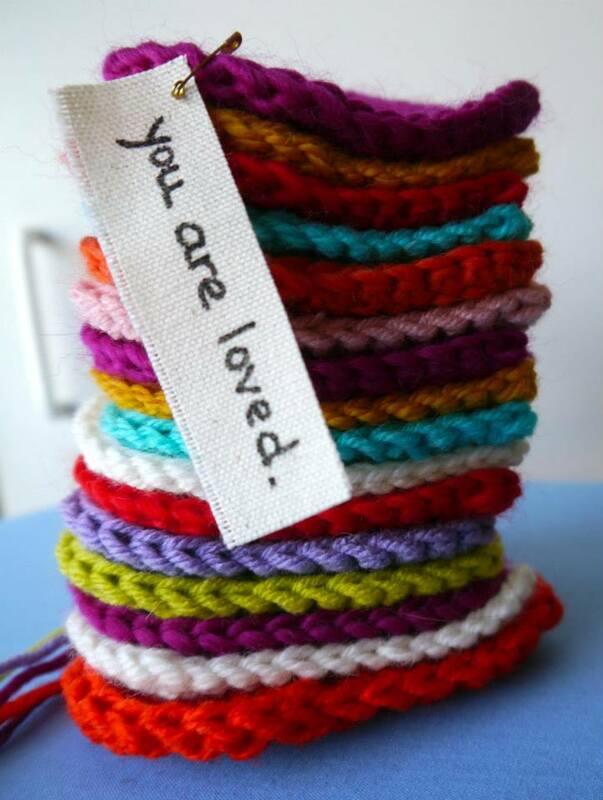 Give one to a friend who needs a little cheering up, or to a relative who’s going through a difficult time or to a complete stranger just to remind them that love is all around. Then, just see what happens to your own heart…it’s an amazing feeling. I encourage you to share your story on the You Are Loved Facebook page about how a heart made its way into your life, whether it was given or received. Maybe one day these little hearts will make their way around the world. Who knows? Love is universal, after all! If you are interested in spreading some love and would like to purchase some hearts, you can find them in my etsy shop. I love this idea! I love the hearts! I have searched for this pattern online and cannot find it. There are patterns out there for hearts but none are as pretty as these. Can you share the pattern? 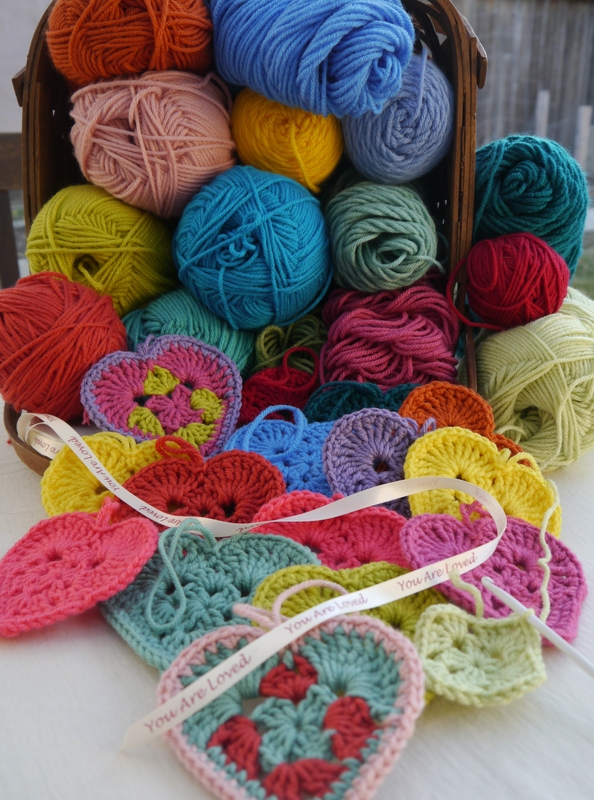 *For those who already crochet, the heart pattern starts as a traditional granny square pattern for the first 2 rounds. It’s best to use a sturdy yarn, like 100% acrylic or wool so that it holds its shape. 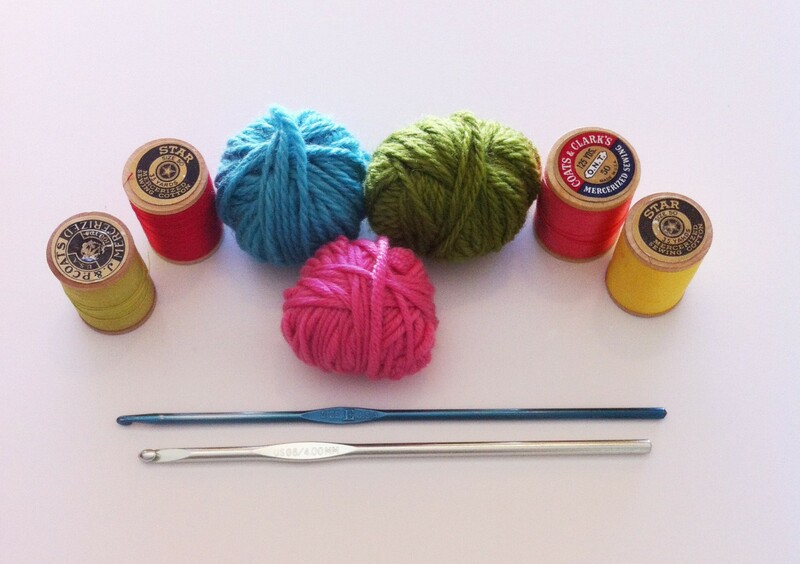 I generally use a worsted weight # 4 yarn and a size G or H hook. Chain 4, join with SS in first chain to form circle. Round 2: SS into next two DC stitches and into the next ch-2 space, ch 3 (counts as first DC), 2 DC in same space, ch 2, 3 DC in same space, *ch 1, 3 DC in next ch-2 space, ch 2, 3 DC in same space, repeat from * twice more, ch 1, join with SS in top of starting ch-3. This now gives you eight 3-DC shells, separated by four ch-2 spaces (which are the corners) and four ch-1 spaces on each side of the square. SC into next 3 DC, SC into last ch-1 space, SS into next stitch to close off the heart. Cut off ends and weave in. Hello. Going through my Inbox finding your comment since far back… How did I miss this. Lovely hearts. I love the multi color idea!!! So Folksy and cool, especially with your choice of colors. I love it! Thank you for the note…I’m a huge admirer of your work, so your compliment is very much appreciated! I think I originally saw this on the emails from “Yarns on First”. I’ve made several and wanted to share my projects. There is an organization that sends small items like this to our Service Men and Women. So I’m making them in Kaki and Red, white and blue. They pray over the items before sending them and I thought hearts would be perfect. I showed these to my 14 year old granddaughter. “Nana, we need to make a bunch of these to hand out at the church’s food pantry.” So I’ve started make nag them in reds now for church. This is a lovely idea and I hope it continues to spread. Thank you for the pattern. It is the prettiest heart pattern around.